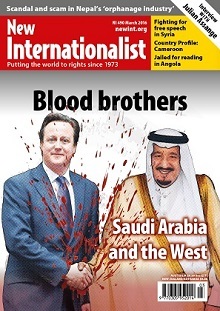 The Saudi regime won’t like this magazine. Nor will the Western governments who kowtow to it while exploiting its wealth and paranoia. The Saudi justice ministry threatened to sue a Twitter user who compared the regime with ISIS after poet Ashraf Fayadh was sentenced to death ‘for spreading atheism and disrespecting the prophet’. It’s illegal to speak to foreign journalists without authorization and what you say could easily land you in jail. What is guaranteed to please neither the Saudi ruling elite nor Western governments is our interview with Julian Assange. He talks about the latest batch of SaudiLeaks. All that and much more in this magazine.